Defending champion Raymond van Barneveld drew 6-6 with Gary Anderson in Manchester on Thursday to avoid an early exit from the Premier League. Belgium's Kim Huybrechts and Suffolk-based Peter Wright were eliminated after the first set of nine round-robin fixtures were completed. 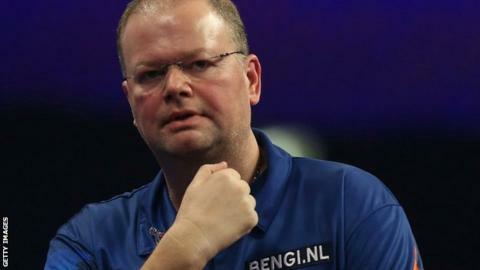 Results earlier in the evening meant a win or draw would send Van Barneveld, 47, through to the next stage. And the Dutchman earned the required draw against world champion Anderson. Huybrechts began week nine bottom of the table, knowing he needed a win against Stephen Bunting to stand any chance of survival, but could only manage a 6-6 draw. Former world champion Adrian Lewis was another man in danger of elimination but he beat Wright 7-4 to secure his place in the final eight, knocking out Wright in the process. The eight remaining players - a group that includes world number one Michael van Gerwen and 16-times world champion Phil Taylor - will face each other again in six more rounds of matches, before the top four in the table after 15 games enter the play-offs in London on 21 May.